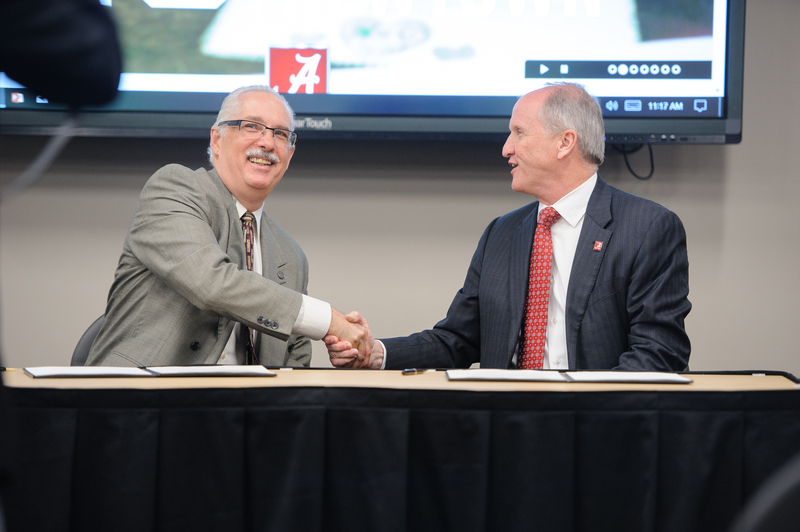 UA President Stuart R. Bell, right, shakes hands with UCAR President Antonio J. Busalacchi after signing a membership declaration. 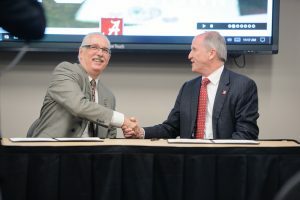 TUSCALOOSA, Ala. — The University of Alabama’s partnership with the University Corporation for Atmospheric Research will benefit students, the state and the nation, said UA President Stuart R. Bell at an on-campus ceremony today. Bell signed an agreement alongside UCAR President Antonio J. Busalacchi declaring UA as a member of the national organization focused on research and training in the atmospheric and related Earth system sciences. UCAR is a consortium of 117 universities and colleges across North America and manages the National Center for Atmospheric Research under sponsorship by the National Science Foundation. Through its community programs, UCAR supports and extends the capabilities of its academic consortium. UA was voted into UCAR at its annual meeting in October, along with six other institutions including Duke University and Louisiana State University. UCAR has a broad community of researchers and world-class assets, including research aircraft, powerful supercomputing and innovative models, that will assist UA in further developing educational and research programs in the atmospheric sciences.